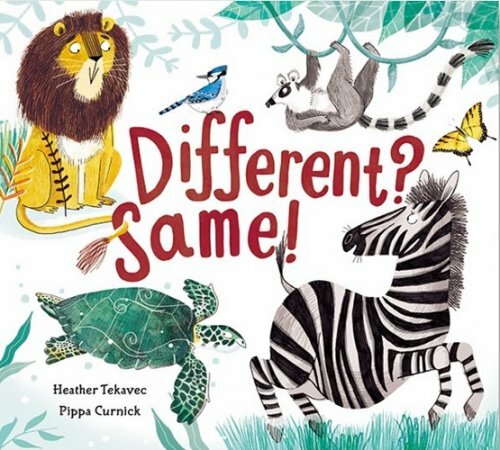 This fun and interactive picture book explores the similarities and differences within a group of animals. For example, the zebra gallops, the bumblebee flies, the lemur leaps and the tiger prowls… But look closer now... they all have STRIPES! This simple format repeats on every page, illustrating how a group of four seemingly different animals all have one distinctive characteristic in common. The characteristics highlighted in this book include horns, whiskers, shells, tentacles and more! ‘Different? Same!’ is a fantastic choice for targeting comparing and contrasting skills. Some of the similarities between the animals require close inspection as they are not always obvious. Cover up the answer on the bottom right corner for those kids who can be challenged to figure out the similarities by themselves! Younger children who are not yet able to make comparisons between animals will love looking at the illustrations and labelling the animals they recognise. Each animal on the page is labelled so children will learn some new animal names, such as ring-tailed lemur, impala, narwhal, sea urchins and rhinoceros beetles. The book is written in the first person, with each animal telling the reader how they are different from the others. The animals say a short sentence either about how they move (e.g. “I gallop”), a characteristic (e.g. “I’m bristly”) or where they live (e.g. “I live in the jungle”). These statements offer great language models of the subjective pronoun ‘I’ and a range of adjectives. For further speech and language targets in ‘Different? Same!’, see the list below.